Streaming service providers and broadcasters understand the complexities involved in OTT delivery and the media distribution chain - from content acquisition to actual transmission. 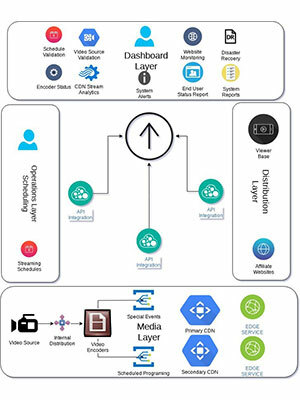 OTT monitoring primarily involves monitoring the status of all key elements in the pipeline starting with the media source, encoders, decoders, output of Content Distribution Network (CDN), etc. The amount of media consumed over OTT is growing at a staggering pace, and people’s viewing habits are rapidly moving towards a unified multi-screen experience. These rapid changes demand a strong comprehensive monitoring solution that takes care of all the aspects in OTT chain and makes it easy for people at various levels in broadcast operations to monitor and control the entire system. Cloud-based applications must be monitored at various levels including user experience. Physically, there is a considerable distance between where the application is running and where the users are. Conventional monitoring, being part of the application environment, makes it technically difficult to monitor how an application behaves at the user’s end - be it a mobile app or a web browser. Internet issues specific to each region are to be monitored. Bad internet connectivity could impact user experience.